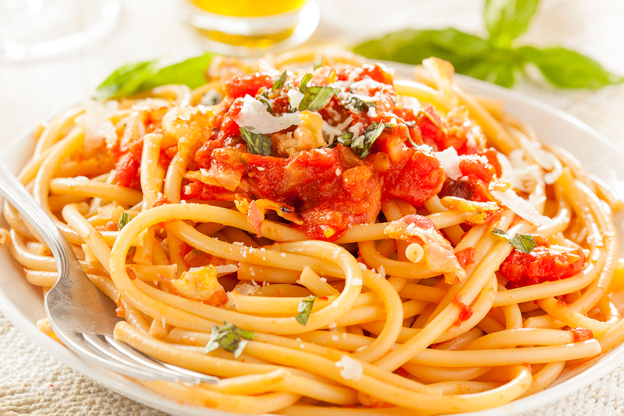 Any food fan in Italy will tell you that one of the cornerstones of any good meal is pasta. Pasta, such a simple concept - basically, unleavened dough - which, taken from its purest form, can result in a myriad of delicious, nutritious dishes. 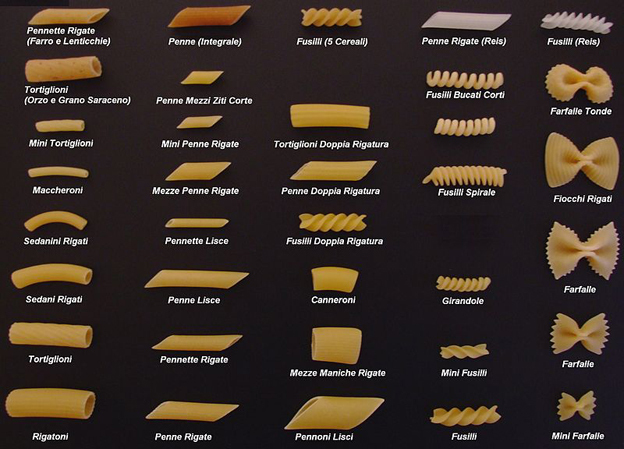 One of the great things about pasta is its large variety of different types, or more precisely, shapes. Recently around 310 specific ones have been documented, as well as their over 1300 names, which vary depending on the region or the area. One of the most traditional is pasta lunga (long pasta), like Spaghetti, Linguine, Fettuccine, Tagliatelle, Tonnarelli and Ziti. These are commonly eaten in both Italy and all around the world, as well as various versions of pasta corta (short pasta), such as Penne, Fusilli, Garganelli, Maccheroni, Cavatelli, Fusilli, Farfalle or Radiatori. Pasta ripiena (stuffed pastas) is also highly popular today, with typical fillings being meat, vegetables and cheese. 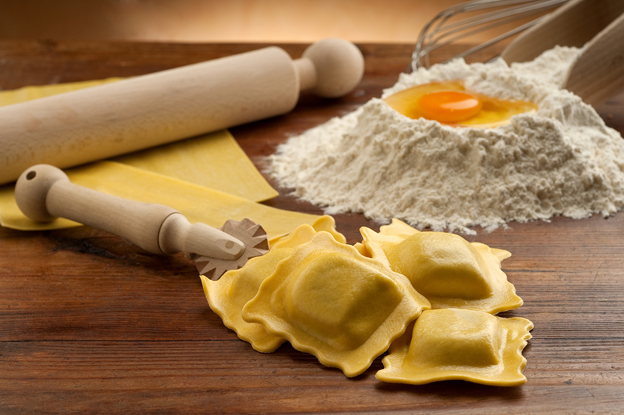 These result in pasta dishes such as Ravioli, Agnolotti, Tortelli or Tortellini. And pasta is even made for soups – special pastas such as Orzi, Quadrucci and Maltagliati are good examples of this perfect accompaniment to a bowl of soup. What are the origins of this simple meal? One rumour is that Venetian merchant traveller Marco Polo was somehow linked with bringing back pasta from China. A written work called The Macaroni Journal was said to have tied in with this reference to pasta, with the aim of promoting this popular food to the United States of America. Another rumour is that Marco Polo was said to have described a food similar to 'Lagana' in his chronicles. Whether or not both or either of these are true is open to speculation, but the origins of pasta, nevertheless, are recorded earlier than in Marco Polo's time (Polo was born in 1254 and died in 1324). The references to Lagana vary in terms of what it is, but they can be traced back as far as the first century in the writings of Horace (in which he refers to them as fine, fried sheets of dough). A similar sort of Lagana is referred to in the next century. Athenaeus of Naucratis wrote of a recipe for sheets of dough made from wheat flour and juice or crushed lettuce, which were spiced and then deep fried in oil (the recipe was attributed to the previous century from Chrysippus of Tyana). Other oblique references to early forms of pasta include a note of Lagana in a 5th century cookbook. This could be argued as a forerunner of Lasagne in that the recipe talks of layers of dough with meat stuffing, although having said that, the method of cooking the dough does not tally with the traditional methods of cooking pasta. However, a compound made from flour and water, known as Itrion, was spotted by Greek physician Galen in the 2nd century. From the 3rd to 5th centuries, Itrium was recorded in the Jerusalem Talmud as a form of boiled dough. While another variant of this, Itriyya, was mentioned in a 9th century dictionary by Arab physician Isho bar Ali as a dish made from semolina which was dried prior to cooking. This was then mentioned in writings for the Norman King of Sicily, Roger II, by Muhammad al-Idrisi in 1154. Vast quantities were said to have been exported from Norman Sicily at around this time. And in fact, this 'forerunner' to pasta was hugely popular in Sicily because it was both healthy and could be stored for a long time (this was particularly crucial for long ship journeys). The concept of pasta had arrived and had made its mark, and was now carving a strong reputation across the globe. But pasta enjoys a special place in Italy's heart, where it is traditionally eaten as the first course or 'Piatto Unico' (a one meal dish). Not only does it taste good, it's highly adaptable, and can be used in conjunction with other meals such as salads or soups. It is also highly nutritious. It's a good source of nutrients such as iron, folate and B-vitamins like thiamine, riboflavin and niacin. It's relatively low in sodium, and in the cases of egg-free pasta, there is no cholesterol. Fresh pasta is locally made with fresh ingredients and, in North and Central Italy, it is usually made with a mixture of eggs and all-purpose flour, what in Italy is referred to as “00” flour. Since it contains eggs, it is more tender compared to dried pasta and only takes about half the time to cook. In the South, in regions such as Apulia, Campania and Sicily, fresh pasta can be made without eggs. The only ingredients needed to make the pasta dough is semolina flour and water, which is often shaped into orecchiette, busiate and cavatelli. Traditionally, fresh pasta was produced by hand, sometimes with the aid of simple tools, but today many varieties of fresh pasta are also commercially produced by large scale machines, and are broadly available in supermarkets. Even dried pasta can be made with or without eggs. The one with eggs is usually labeled as Pasta all'Uovo while it is generally understood that "normal" dried pasta has no eggs in it. In the right conditions, dried pasta can be stored up to two years. An Italian law states that dried pasta can only be made with 100% durum wheat flour (durum wheat semolina) and needs to be dried at a low temperature for several days to evaporate all the moisture allowing it to be stored for a longer period. The other notable aspect of making good, traditional pasta dishes is the pattern. A good number of traditional pasta types are 'ridged' on the surface, such as Penne Rigate, which means that they absorb the pasta sauce particularly well. Most dried pasta is commercially produced via an extrusion process. Making pasta with a copper or bronze mould ensures that even pasta liscia (pasta with no ridges) gets a rough surface able to better absorb the sauce – a steel mould may be cheaper, but it will not produce the desired effect because it is smoother. Whether you are eating in from the comfort of your own home or eating out in a restaurant, nothing hits the spot quite like a good, well-made pasta dish. It is rich, full of flavour, and above all, delicious!